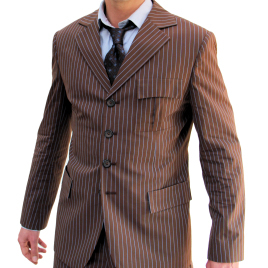 I purchased one of these suits last year (custom cotton brown w/blue stripes) and all I can say is WOW! I was a bit worried about providing my own measurements at first, but the suit fits me better than any suit I own, especially the trousers! No alterations were required! You'll be sure to turn heads wearing this suit, and you'll be looking very sharp in the process! If you're thinking about ordering one of these, do yourself a favor and just do it!